Times past, ThinCats had neither the resources to carry out extensive development of the platform, or to keep our lenders adequately informed. But that is changing. We have been putting considerable capital towards supporting lenders, and are allocating more. ThinCats’ chief technology officer, Steve Thomson, gives an update on what’s been happening on the IT front, and what development we have in our immediate pipeline here. Resources have been increased where they will have the greatest benefit to lenders on the platform. So we haven’t, yet, built a fancy front end, although we want the end experience to be as intuitive and easy as possible. And we certainly haven’t been building Google-style premises. That said, we will be moving to bigger offices to support more staff and a better technology infrastructure. Some we have communicated already, and more recent and imminent ones are outlined below. ThinCats has relied historically on Sponsors to do much of the client relationship management. When run on little resource, this was inevitable. However, while our Sponsors prepare loan documentation and the like for lenders, and answer their questions regarding loans they have put together, their main responsibility is to the borrower who has engaged them. We are developing a more efficient division of labour. ThinCats, as a platform, is there to represent the interests of the lender, and we have been strengthening this aspect over the past few months. We have taken the decision to move the monitoring of financial performance of all new borrowers in house and have recruited a monitoring manager to undertake this. Melanie Lee will now be overseeing this, in the interest of our lenders. We have put a recoveries team in place, around Jill Sandford. We’ve further strengthened the team over the past month with the hire of recoveries manager Toni Shukla. The expansion of this function is part of our stated intention to have clear responsibilities, rather than any anticipation of an increase in defaults. Other recent or coming hires include that of an experienced person to work within the operations team, Guy Whittaker. We are also recruiting a full time loan administrator, June Price, who in addition to listing loans for auction will work with the securities team to ensure that all loan and security documentation is received and where appropriate security is registered prior to drawdown. 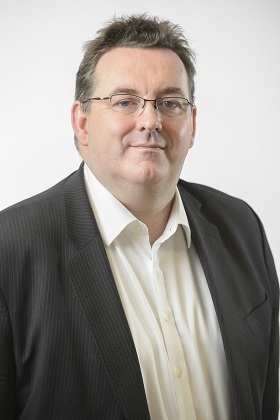 The building of a well-resourced and experienced credit team, led by Simon Brook, is another vital development. The decision whether to invest will always rest with the individual lender, but we are working to ensure that this decision is made with the best information – information our experts have scrutinised and interrogated first – so investors know they are getting clear and accurate information, expressed in a consistent fashion across different loans. Much of this is still a work in progress, but we are getting there – and quickly. We will have more to come over the year, particularly on the credit front, which we won’t be shy of telling you about. As ever, we value your opinion and feedback – what’s working, what isn’t and where you would like to see more resources placed. 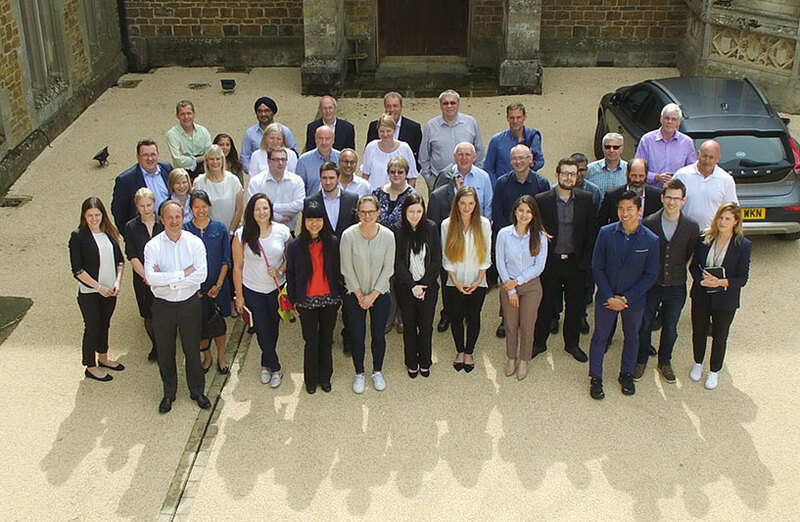 This is – most of – the combined ThinCats and parent company ESF team, taken at a recent meeting. The combined organisations include IT, origination, recoveries, compliance and client services functions. Most of these did not exist one year ago. Those that did, such as IT, have seen a significant increase in resources (see IT update here). It’s heartening to know, however, that there is a firm base on which we build in that the core team has remained constant. Simon Brook headshotCredit quality is the foundation of any lending business. This is why ThinCats has been building up capability in this area over the past few months. Working alongside the Sponsors to structure loans for the platform, we continue to build the team, led by Simon Brook (pictured). The credit team look at all new loans, reviewing both the borrowers’ ability to pay and the quality of the underlying security. It also does the groundwork for any underwriting, thus ensuring loan auctions are fully funded. Simon doesn’t like to be described as ‘poacher turned gamekeeper’, but it gives a flavour of his experience in SME credit. 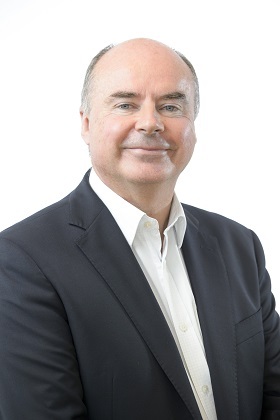 Over a career spanning more than 30 years in the sector, he has worked most facets of a multi-faceted industry: starting in banking, he moved on to asset finance, working as an introducer, principle and lender. This experience, along with that of his team, is now at the disposal of ThinCats’ lenders. We are looking at further enhancements to how we scrutinise the credit quality on the platform, which we will be rolling out over the coming months. Since the last newsletter, a lot has been happening in the ThinCats Technology team. Much of it has been focused on building out our in-house team and meeting the challenges placed on us by full FCA regulation. As such, the activity has been mainly behind the scenes in the first half of 2016, but critically important in supporting the business as it grows and protecting our lenders. As we said in our last newsletter, we are on a journey to take full control of our Technology – that means the responsibility for development of our applications in the future as well as running and providing support to our applications on a 24-7-365 basis. Historically, this has been done by our technology partner. The first step is the transfer of the hosting of our applications and infrastructure from Ireland to Rackspace in the UK, to ensure that all client data is located in the UK and that we were able to fully meet FCA requirements. Rackspace is the hosting partner that the FCA itself uses. We will have completed this transition by the end of July. We then expect to transfer responsibility for support by the end of August and will have taken over responsibility for all development by the end of 2016. We have also made a number of important changes that directly affects the security, efficiency and stability of the site. While not all of these changes are immediately visible, they are the foundations for delivering better and higher quality services at a much faster rate. To support this, we have expanded the Technology team from three at the end of last year to eight today, with a plan to reach 11 by the end of the year. If you are active on the forums, you should also notice that we are starting to have more of a presence there as ‘ThinCats IT’, and are more pro-active in addressing issues that arise. Begin redesigning the overall user interface for the application – we plan to create a Beta service for clients to try the changes ahead of time and provide feedback. And some new features that the business will announce shortly. We appreciate this has been a long and sometimes arduous process for ThinCats’ long-term supporters, but we are making steady progress building the foundations for a better future. We hope that you will start to see and feel the results of this investment soon. Trying to predict what will happen in this market is like trying to catch a falling knife during an explosion in a Sabatier factory. Whatever the outcome, right now it has produced massive volatility in traditional asset classes and depressed yields in conventional fixed income securities, with 10-year gilts yielding less than 1% for the first time the Monday after the Brexit vote. It’s not all down to one vote on one island. Two weeks before the Brexit vote, US 10-year Treasury yields hit a three-year low and the 10-year German Bund delivered negative interest rates for the first time ever. In effect, the German government was charging people for lending them money. We’ve also been told that UK house prices look like they’ve topped out, so that great repository of wealth and dinner party conversation can no longer be relied on, it seems. Equities? Your guess is as good as mine, and probably just as valuable as anything issuing from a central banker. However, to be fair to central bankers, negative interest rates could (very charitably) be interpreted as an indication that their plans are working: the European Central Bank has been buying government bonds since last spring in order to support Europe’s fragile recovery through quantitative easing. This is supposed to drive down government bond yields, and so make other assets relatively more attractive. Assets such as P2P loans. So maybe the ECB does know what it’s doing. Other explanations are available, though these needn’t detain us here. Suffice it to say, however smart the pointy heads at the ECB may or may not be, the foundation of income investment for the past few centuries is now hugely unattractive, and P2P loans seem much more enticing. While we wouldn’t argue that the German government has the same risk profile as a Merseyside brewery or a coach company from Kent, a broad portfolio of SME loans allows one to constrain risk through diversification: the factors influencing the performance two example companies above are rather different. What is more, ThinCats P2P gives access to secured loans. That means lenders have a claim on the assets of the borrower. This is another distinguishing factor from ‘conventional’ fixed income assets: in the highly unlikely event of the German government defaulting, its debtors wouldn’t get to sell off the Brandenburg Gate or receive the revenues from the Bundestag’s carpark to settle its debt. But secured loans mean that this is effectively what creditors can do. If German finance minister Wolfgang Schäuble wants to take out a P2P loan on behalf of his government, lenders could ask for a rail network or the like as security. This ‘lower for longer’ environment does seem to have become the new normal, as ‘longer’ has proven to be a most elastic concept. In this world, something combining a decent yield and security makes a lot more sense than paying governments for the privilege of lending to them. 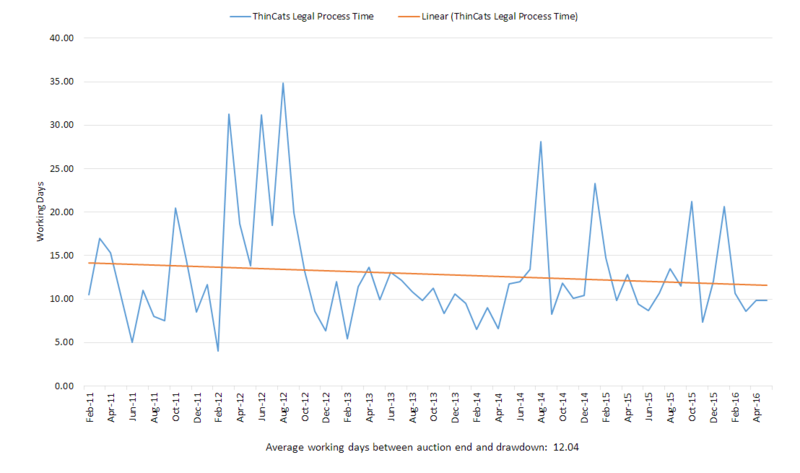 Average drawdown times have been in decline since ThinCats launched five years ago (see graph). As you can see, there’s a lot of volatility in the graph. This is largely down to the fact that deals range from the very simple to complex, with legal covenants and debentures over assets to protect lenders. That will always represent a floor on drawdown time, and one which we will not compromise on. However, greater resources devoted to this issue may see drawdown times be further squeezed, as we endeavour to combine speed with a secure, comprehensive review of loans. May saw the highest number of loans on the platform since last summer, and the trend is gently upwards. 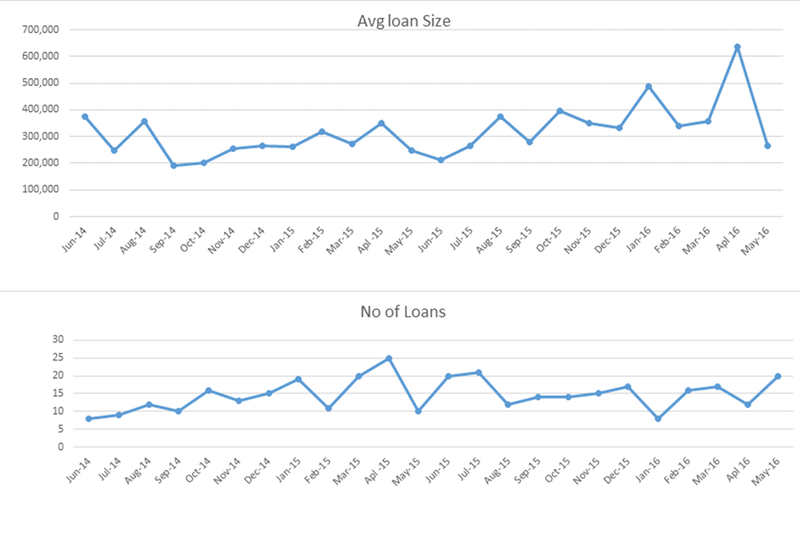 Likewise, the average loan size is creeping up, as we succeed in demonstrating the ease and effectiveness of P2P to larger businesses. The loan size in April was at its highest ever. This was driven by the listing of insurer LAMP Group, which took out an underwritten £3.5m loan on Thincats – the largest non-property P2P loan ever, at the time of listing.